Nominated by Crafts by the Sea. Nominated by Curls & Q and The Sweaty Knitter. In addition, I received a surprise reward from Agujas for being her 100th follower. She sent me a scarf kit from Habu Textiles. One cone is a very fine merino (red). The other cone holds a very interesting silk and stainless steel yarn. 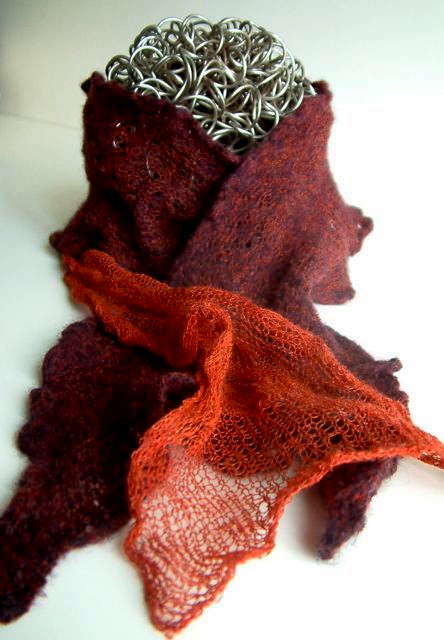 The idea is to knit the scarf in several sections, sometimes with one yarn, sometimes with the other, and sometime with both.Then you felt it. Of course, stainless steel doesn’t tend to cooperate with felting, so you get a scarf with a really fascinating crumpled look. Like a scarf buried for years in the back of your coat closet, only fashionable and artistic. Trust me. Stanley posing with my gift from Agujas. You’re making me do this again, Mom? See, isn’t this neat looking? I love the pre-planned rumpled look. It goes so well with the rest of my wardrobe. Kusha Kusha Scarf by Setsuko Torii (鳥居節子) as seen on Ravelry. All of this attention and luck makes me feel very happy. I love writing a blog that others enjoy reading. And I’m delighted to be Agujas’ 100th follower. She has a wonderful blog and I’m sure she’ll soon have more followers than she knows what to do with. I also have some obligations to fulfill as recipient of these two awards. Rather than write separate posts, I’m going to combine it all into one. I’ve noticed that there is a lot of variety in how different bloggers have responded to these awards in the past. There doesn’t seem to be a specific formula to follow or even a consistent set of questions to answer. So I feel free to make it up as I go along. May all things curl that you wish to curl. May the sea inspire you with its crashing might and not deposit salt upon your hand knits. And may the wool maketh not your hands to perspire at inconvenient moments. Instead of doing this, I think I’m going to pose questions to other knitters. Things I’ve always wanted to know but was afraid to ask. Do you hold on to horrible yarn from your early knitting days because you’re convinced that it hates you as much as you hate it…and it’s good to keep your enemies close? What do you do when you give someone a lovely hand-made gift that they don’t like or don’t use? Is covert reclamation allowed? When your mother in law gives you a large bag full of cotton yarn to make dish cloths out of, how much obligation do you have to start popping them out? Is the obligation greater if you have not given her grandchildren? Are shawls really fashionable these days, or is that a delusion I’ve fostered to deny that I dress like a Jane Austen reenacter? Does my knitting really make the whole couch vibrate? What would you do with all the spare time you would have if you didn’t knit? Would you be thinner? 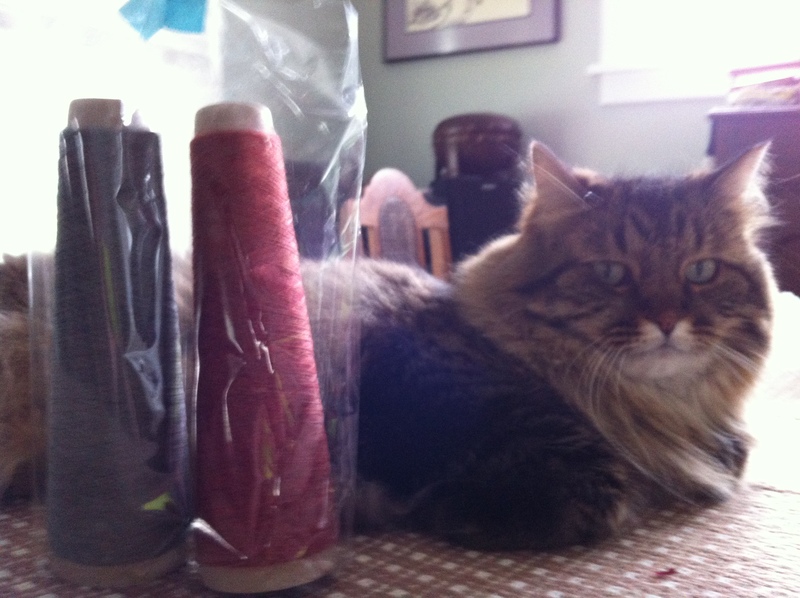 Do you think sheep would find it creepy that I spend so much time petting yarn? 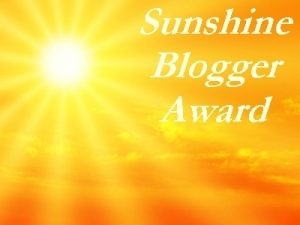 In no particular order, here are a few other bloggers I would like to nominate for the One Lovely Sunshine Blog Award(s). 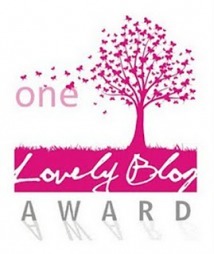 I’ve nominated these bloggers because I’ve had some recent, very positive interactions with them online. They are active and talented crafters and writers. I admire what they do. Thank you! 🙂 Those questions are hilarious! I’m thinking that I would definitely be thinner, lol! I have horrible yarn which I purchased very early in my knitting days. On the label it said ‘you need 8 balls to knit this cardigan pattern on the label’. I thought that it couldn’t be too hard to knit a cardigan if the instructions fitted on a ball band so hey- why not? Little did I know that it was a link to a website where you could download a pattern, full of acronyms and things I had never seen before. And the yarn was horrible splitty stuff which I still can’t get to work for me. So I have worked my way through 5 balls of the stuff and it’s been made into various scarves, and test objects. But I still hold onto it even though I have planned for balloons to fall from the ceiling when I finally use the last of it. The rest of the questions might just make their way into a blog post. Second to last question: I’ve no doubt at all that I might be thinner. But then I wouldn’t be up on all the reruns from USA network either…. When does Covert Affairs start up for the summer? Wow, I never heard of stainless steel in yarn. I can’t imagine what it would feel like. Nice blog! Stopping by from Weekend Knitter. I haven’t knitted with it yet. I’m not sure how high the steel content is but it must be on the low end otherwise you would injure yourself trying to l it with it.